The crew (Owen Mason, Anne Garland, Mary Beth Timm, Laura Crawford and myself) gathered out at NARL, at a small yellow warehouse. We were using UIC Science archaeological gear. IHLC & Ilisagvik College let us use some tents, sleeping pads & kitchen gear. 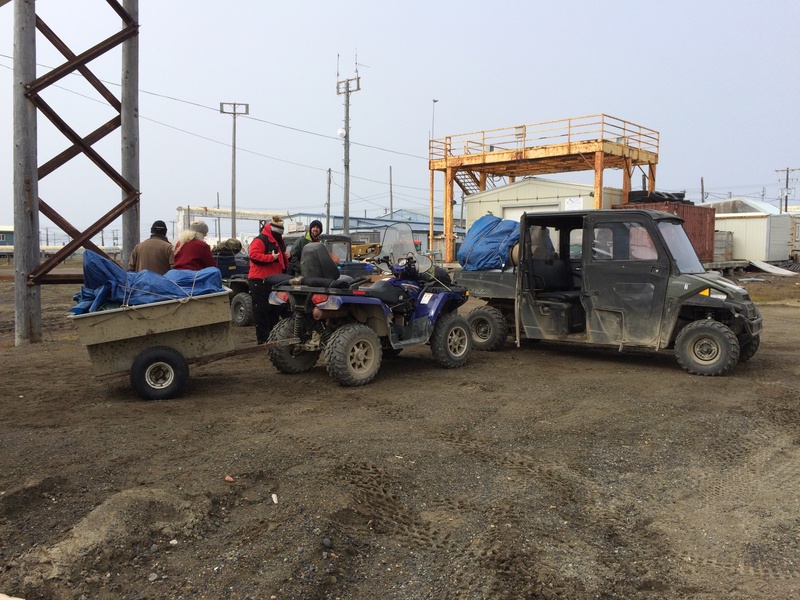 We managed to get everything packed into side-by-sides and trailers and headed off to Walakpa with Sean Gunnells, Oona Edwardsen and Ray Kious of the UICS logistics staff who weren’t otherwise occupied. We got to Walakpa around 2PM. We got camp set up, with a slight hitch because some of the tents had not been repacked properly when last used. However, the logistics staff dealt with it, and headed back to town. We uncovered portions of the bluff so that we could examine the profiles and decide where we want to take the column sample. While walking the beach examining the bluff profiles, we noticed that there was a cultural layer exposed in the mound with one of the two monuments on it. Anne Garland laid out a 1×1 meter test, well back from the edge of the bluff, to see if it continued across the mound. 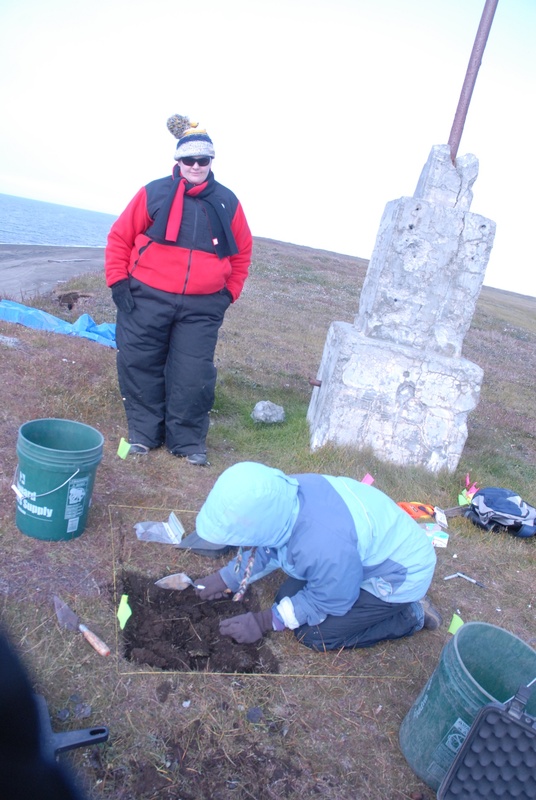 Laura Crawford excavating the SW quadrant of a 1×1 while Mary Beth Timm looks on. View NE along the coast toward Barrow. It was clear that we couldn’t safely do a profile in the central area where the meat cache had been, since there was still an overhang. 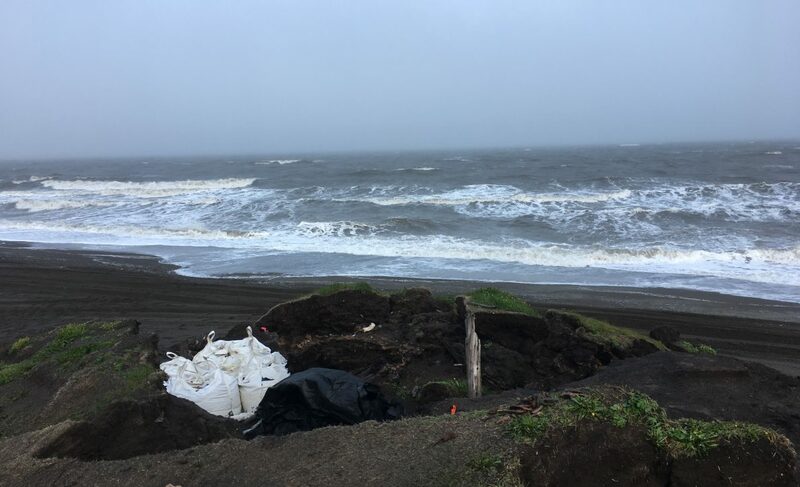 In addition, some of the geotextile fabric protecting the site was pinned by collapse of bluffs, preventing its removal. Eventually, after cleaning profiles on either side of the overhang, we picked a spot and Owen went to work on a detailed drawing. We had visitors in the early morning, a young couple whose ATV had a flat, and were hoping that we had a tire pump. Unfortunately, we didn’t, so they headed on up the coast with both of them on one side of the ATV. Posted on August 3, 2015 August 2, 2015 by Anne JensenPosted in Alaska, Archaeology, Arctic, Barrow, equipment, field, WalakpaTagged Archaeology, Arctic, Barrow, crew, field, Walakpa.